In the last year or so I've written three posts [1, 2, 3] about this slow burning DBA project. 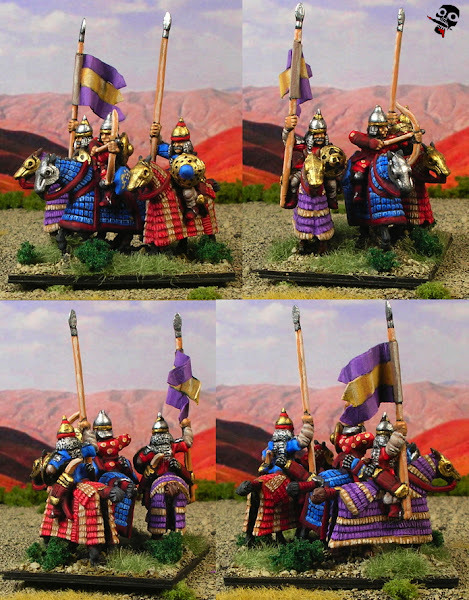 I've not really done too much lately but I've been inspired to do more by a recent article by Neldoreth at An Hour of Wolves and Shattered Shields who is also building a Medieval Persian army using Roundway figures from Navwar. As you can see from the picture below Neldoreth's painting style is excellent and he's devised some great patterns and colour schemes for the quilted horse armour. A great reference site and highly recommended.